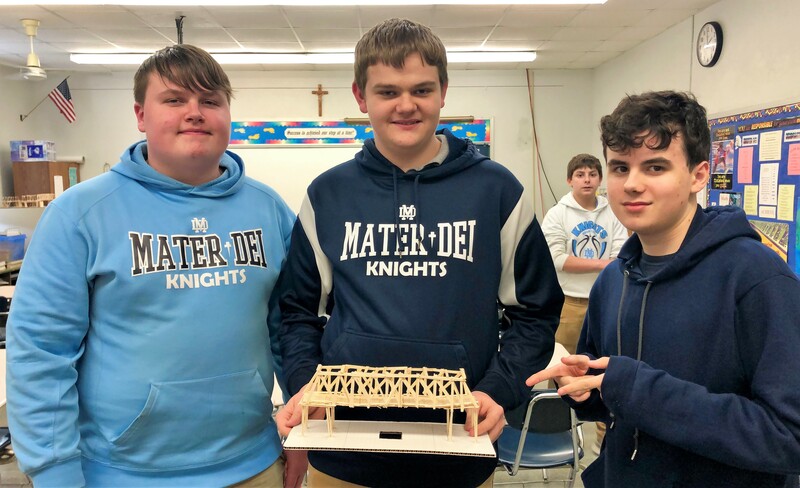 Mathematics teacher Mrs. Deb Foote recently held a bridge-breaking competition for the bridges her students built using only toothpicks and glue. Kaleb Kues, Brennan Kehrer, and Connor Nicklin won the weight bearing competition, in which their bridge held 33 pounds before breaking (100 times the weight of the bridge). 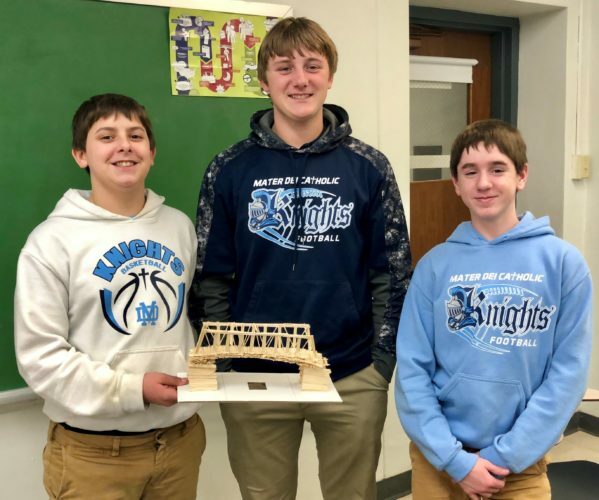 Jack Lampe, Rhett Timmermann, and Miles Guillot won the weight bearing-to-bridge weight ratio competition, in which their bridge held 222 times its own weight before breaking (25 pounds). (from left) Kaleb Kues, Brennan Kehrer, and Connor Nicklin are pictured with their bridge prior to winning the weight bearing competition, in which their bridge held 33 pounds before breaking (100 times the weight of the bridge). The bridges were constructed with only toothpicks and glue for Mrs. Deb Foote’s mathematics class. (from left) Jack Lampe, Rhett Timmermann, and Miles Guillot are pictured with their bridge prior to winning the weight bearing-to-bridge weight ratio competition, in which their bridge held 222 times its own weight before breaking (25 pounds). The bridges were constructed with only toothpicks and glue for Mrs. Deb Foote’s mathematics class.